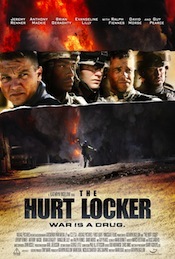 The first-ever Oscar-winner for Best Picture and Best Director to be directed by a woman, Kathryn Bigelow’s gritty, tense look at the work of an American explosive disposal team during the Iraq War features a star-making turn from star Jeremy Renner and a dazzling screenplay from first-time screenwriter and veteran journalist Mark Boal. Best known for his driven, muscular action scores for such pictures as Blade II, Terminator 3: Rise of the Machines, Hellboy and I, Robot, composer Marco Beltrami, here collaborating with his former assistant Buck Sanders, fuses their trademark synthesizer work with traditional Middle Eastern themes and arrangements to form a sometimes eerie, frequently disturbingly cacophonous mélange of old and new, east and west, exotic and familiar. By design, it’s an effort oriented toward mood and ambience with abrupt shifts in tone, meter and instrumentation as displayed in such hauntingly evocative tracks as "The Long Walk," "Man in the Green Bomb Suit " and "Body Bomb." Brooding drones steadliy build as scary voices and sound design elements add to the eeriness and tension. A dark, brooding atmosphere with looming drones, string effects, and sound design. A dark atmosphere featuring eerie electronics over a consistent backbeat. A terrifying soundscape of plucked strings and eerie electronic effects. A brooding beat begins at 1:18. A brooding atmosphere with a Middle Eastern feel created by a kamanche. Dissonant, building drones and strings create a brooding atmosphere. A brooding atmosphere that builds with a Middle Eastern feel, featuring kamanche, electronic effects, and a solemn, marching bass drum beat. A brooding atmosphere that builds with a tense, Middle Eastern feel, featuring kamanche and double bass with electronic effects. A terrifying soundscape of echoing effects and tense strings. At 0:55, Middle Eastern kamanche enters with a desolate melody. Desolate drones and effects move in and out. At 1:14, dense drones take over and build tension. An poignant melody featuring electric guitar, ambient drones, and electronics.